Great job! Our attendees love the tricks. Lots of fun at an affordable price. Mr. Magic, thank you for making our dinner com alive. Many, including myself, were amazed and we enjoyed the show. We appreciate the great job you did! p.s. My husband enjoyed himself tremendously! Mr. Magic is great. His ability to relate to both children and adults in humorous manner ... all the while astonishing them with his magical abilities is truly amazing. Our guests really enjoy his shows. The song that keeps running through my head, "This Magic Moment" by the Drifters in 1958. If keeping a discerning audience, aged 11 to 82, enraptured for a full hour was your goal...then you succeeded!!! 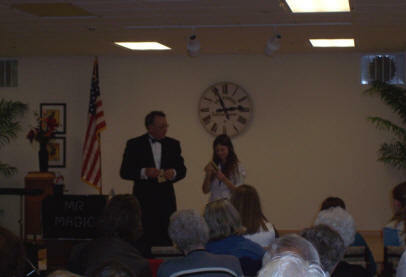 Super Entertaining -- All enjoyed his Magic show.. Thank you for providing such an entertaining evening for us! Interaction with our group is most important. Great tricks help, but the social and humor were top priority and you made our weekend better than we could have imagined ... magical even...! 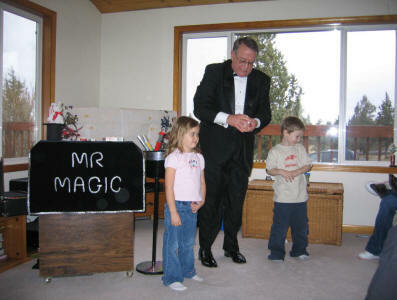 I have seen Mr. Magic perform at many local events over the years. 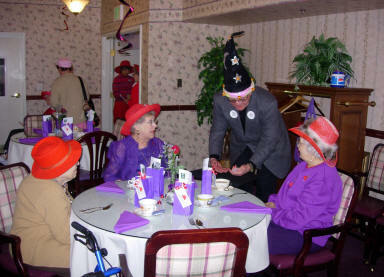 When my company was soliciting ideas for entertainment at our work holiday party, I immediately thought of Mr. Magic. I emailed him through his website and received a quick response with availability and rates. He offers a number of services that would fit any type of event, but we chose “walk-around/close up” magic to have him float around the party during cocktails/hors d’oeuvres. Mr. Magic was fantastic! 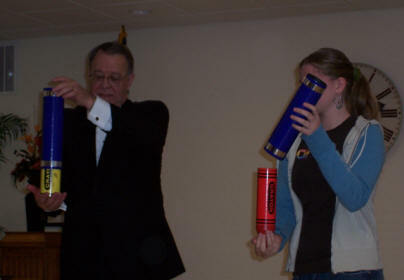 He moved around to different groups and always had a new trick to perform. 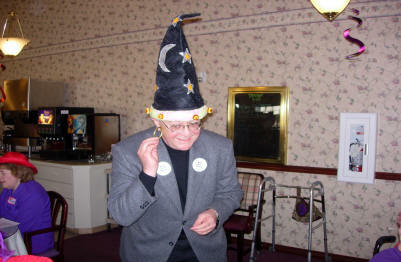 His magic was accompanied by witty jokes that had everyone rolling. I was impressed to see how well he adapted to a crowd of all adults when I have primarily seen him perform for children & adults at past events. 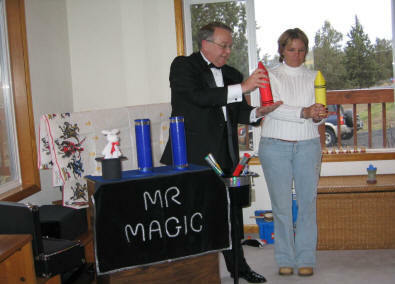 Mr. Magic is a true performer that will bring entertainment and amusement to any type of event and any audience. 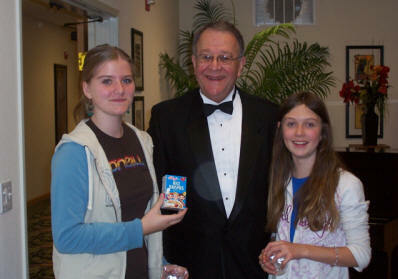 Thank you so much for the wonderfully entertaining magic show that you put on for our daughters birthday party! Everyone really enjoyed it! The party favor bags were perfect and the Chinese Finger Torture toys were a big hit. I appreciate you performing for us on your birthday too and I'm sorry that I forgot to give you a birthday cupcake before you left. Hope to see you around Sunriver! Just wanted to say thank you for a great performance. Everyone enjoyed the show and audience interaction was so much fun. Very professional, friendly and entertaining. Great memories! Thank you so much, loved the magic! Thank you so much! 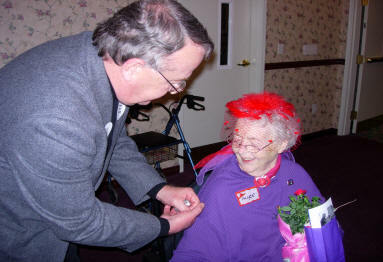 We all enjoyed your very fun and lighthearted show for our Annual Volunteer Appreciation Luncheon. We apologize for not having a better microphone situation, lapel would have been better. Might have been a little quiet for some, but all in all, it was great. :-) Definitely will recommend to others. 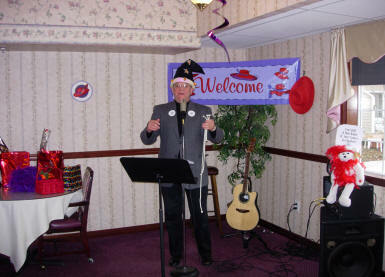 Always entertains the young people at our New Years Eve party. It will be a lifetime of memories for our daughter. Everyone enjoyed the show! Perfect for our 8 year old Birthday party. The are still playing with the magic tricks. 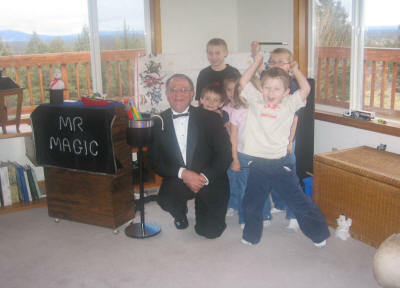 Friendly and Charming -- Mr. Magic was a hit with both the adults and the children. 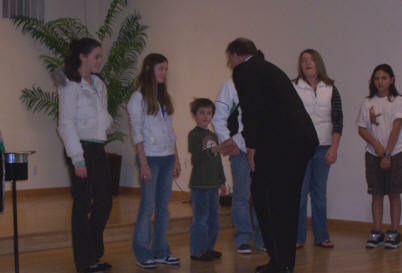 He always had a a small crowd around him (during his 3 hours of Close-up magic). Thanks for the entertainment and the joy! 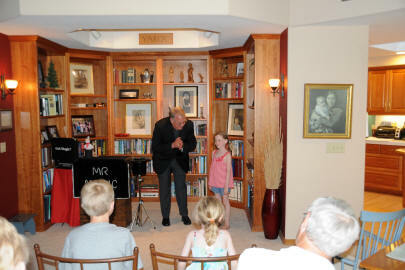 Mr. Magic performed a show in our home while our kids and grandkids were visiting. It was fantastic...a highlight of their week in Sunriver. It was a wonderful, entertaining evening. I heartily recommend Mr. Magic. Thanks Mr. Magic. Our granddaughter looked up the website and tried some magic tricks. She enjoyed your show once again, as I am sure all the other guest did as well. Thanks! Thank you for a great performance. I apologize for the delay in writing this email. I just wanted to say thank you for a fantastic magic performance. 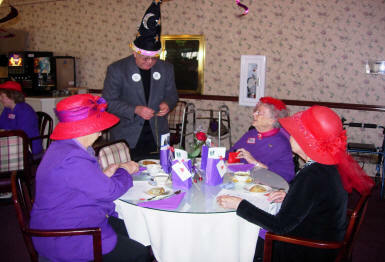 Our group ranged in age from 2 yrs old - 94 yrs old and everyone was entertained and loved the show. My kids were absolutely thrilled with the Mr. Magic mini-wands that you gave them at the end of the show. Thanks a lot! 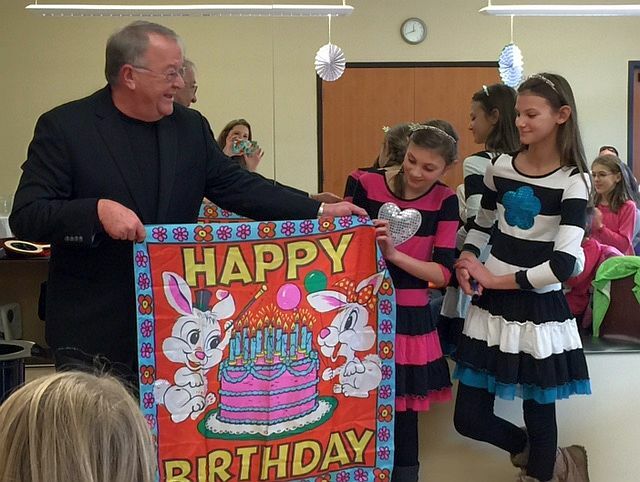 He included all our grandkids in the birthday show, which was a big hit and they loved the Mr. Magic mini-wands. Your flexibility of having the show in the garage, because of the rain was appreciated. We have talked about you more than once...even after the show! 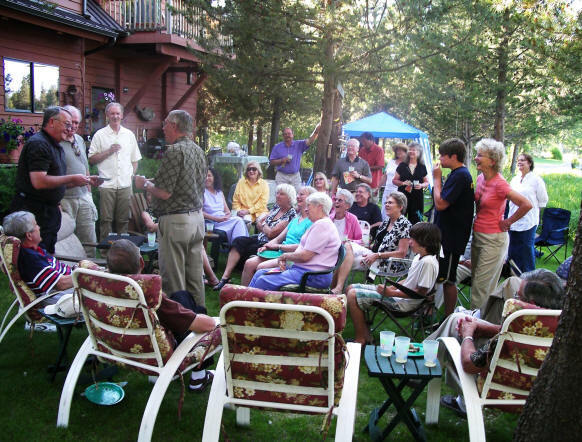 Very entertaining and fun for all ... kids and adults at our annual picnic in Sunriver. 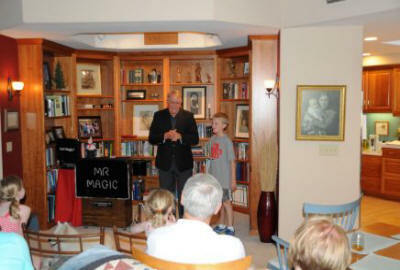 We very much enjoyed the Mr. Magic show for my wife's 60th Birthday celebration. 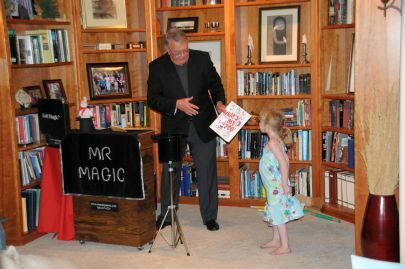 The interactive and casual approach where Mr. Magic went from group to group on our back patio was a lively & fun addition to our party as he amazed and amused our guests. It was a big hit! The families of the boy scouts and cub scouts at our Blue & Gold banquet really enjoyed all the audience participation and the great tricks for the kids you handed out. Thank you for working with us. Karen Stanton, Group Leader for the Blue & Gold Banquet. The crowd participation was great! The audience really enjoyed interacting with Mr. Magic. They also enjoyed learning a trick of their own. Everyone had a great time. Great shows, guests, as always, enjoyed all the performances. I cannot thank you enough for your magical service yesterday at our Grand Opening of the SHARC. You created so many smiling faces. I loved watching you interact with everyone. You are so good at what you do…thank you so much! It was great! Adults & kids enjoyed very much. Didn't hear anything but awesome comments. Thank you soooo much! We will definitely use Mr. Magic again! 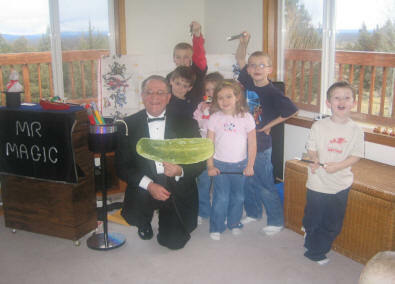 We all enjoyed your magic show very much -- especially the kids, they were so excited. You did fantastic. Good crowd, one of the largest we have ever had. I will call this fall with some dates for next year. I will pass the word around to our other Thousand Trails Parks again as well. Thanks! Mr. Magic had all the students fully engaged. You could see the students trying to figure out how each trick was accomplished. His show was perfect for our school. Thank You. Thank you for your fabulous brand of entertainment! You were loved by small children, the "80 year old birthday girl" and every age in between. I wanted to let you know how much the staff appreciated the magic show last night! You had the crowd laughing … and nobody could figure out how you did your various magic tricks. It was perfect and like I have been saying … took so much pressure and stress off of Dr. Olin and I for not having to put together a skit or performance (like we have done for the last 16 years!) for the group. It was so much more fun sitting back and enjoying a show, instead of being the show. I look forward to recommending you and your show to our friends or colleagues who might be interested in some fun entertainment in the future. I did shoot a few pictures during your show, which I thought you might enjoy or like as well. They’re not all perfectly focused … but keep the ones you like J. Thanks again! Great feedback from all our guests. Wonderful "Magic" -- we were all stumped! Your presentation made for a wonderful party. Thanks. 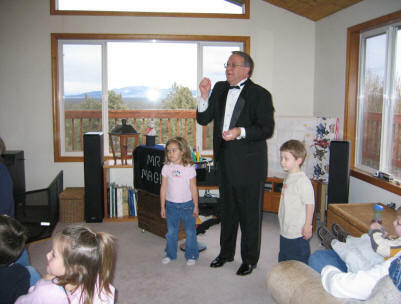 I just wanted to drop you a note and thank you again for the great magic show you did for all of the employees at Sunriver Resort. We have had so many people tell us it was the best employee meeting we have ever had and the most entertaining meeting we have ever had because of you. 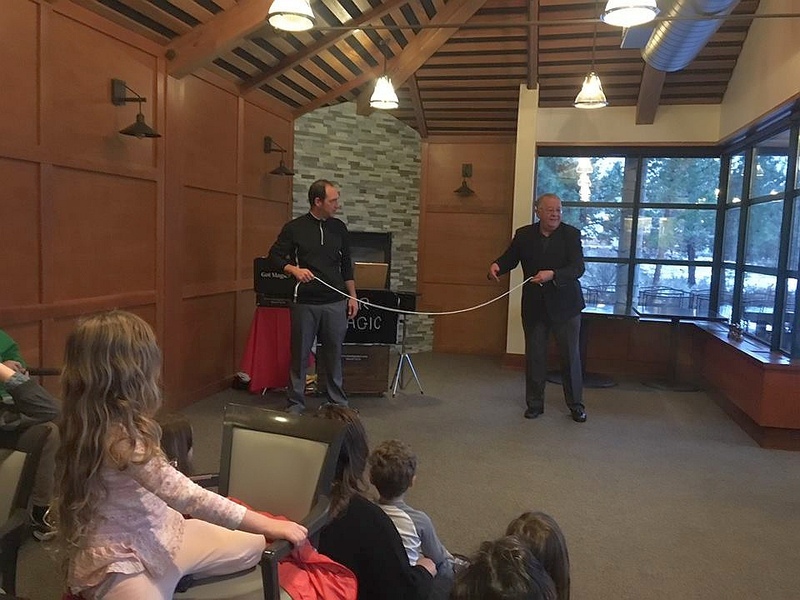 I especially appreciated the way you incorporated your magic tricks to specific departments and the culture here at Sunriver Resort. The theme of “Moments of Magic” is something I know our staff will remember for years as they continue to provide life-long memories for our guests who visit Sunriver Resort. Please know you can use me as a reference. I will always recommend you to anyone and look forward to using your talents again soon. Fantastic!! Kids are still talking about it. Made for a great memory for a magic birthday. Thank you so very much. Kids love showing off Mr. Zippy. The Board of Directors of Wonderland Express and our organizing committee sincerely thank you for making this event possible. Children who attended walked away with magical memories that will last a lifetime...and parents were able to give their children the gift of quality family time, where the pressures and problems they face were put aside for the day. 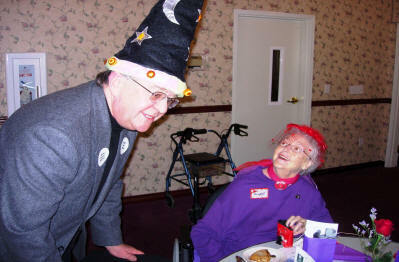 We hope that we can count on your support for the 9th Annual Wonderland Express, scheduled for December 12, 2010. Thanks again for another great show! Feedback from guests and staff was all positive. You were easy to work with. Always ready to perform on time (for all Traditions events). Good rapport with audience. Very personable and friendly. We have enjoyed having Mr. Magic entertain at our annual customer BBQ for the last four years. Kids and adults alike enjoy the interactive and mingling with the group. Look forward to next year. Our daughter participated with Mr. Magic...amazing as she is so shy. I would have Mr. Magic do another party. The kids were talking about Mr. Magic and the party for weeks. 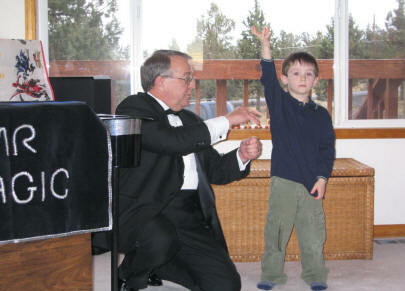 They gave magic shows to their parents. It was also fun for the parents who attended the party. We loved it Mr. Magic! The kids could not stop talking about you. One of Bode's friends went home and put on his black collard shirt and long pants and his parents told me that we had "raised the bar" for birthday parties. I have been meaning to write you a Thank You card all week. Your show was enjoyed by all, from young to old. Mr. Magic was the hit of the party! Thanks. 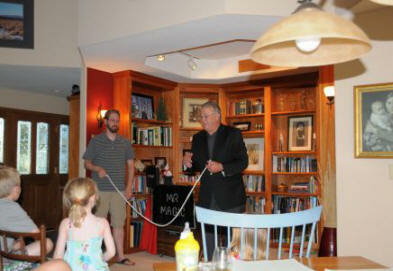 Once again, very professional and entertaining for young guests, parents, and grandparents. Everyone loved the show! See you next year...Thanks! I heard tons of positive feedback from co-workers. Your show was a hit with our group. You see, funeral directors are just normal folk who enjoy entertainment -- which we did. Thank you for a job very well done!!! Merry Christmas to you and your family. Thank you so much for coming to our Cub Scout Den meeting to teach the boys some magic. The boys enjoyed it and were very intrigued by it . We appreciate your time. I loved the show! Greatly entertaining - would even like a longer show next time. May book for my adults party. Thanks! As always -- show was a hit! Folks look forward to your return in June. Always great comments. Thanks again for the wonderful show. It was enjoyed by all (young and old). I heard Noah and Anthea talking to their mother about Mr. Magic and Anthea said that she will always remember her 10th birthday party! Outstanding show filled with skill and humor, covering ages from 7 to 95. Fun filled hour that kept all involved. Thank you so much for a really Great Show! I have heard nothing but positive comments -- everyone had a wonderful time. I saw all smiles during and after your performance. I was keeping my eyes on one couple who were not smiling when you began...after a few minutes, smiles were on their faces and stayed that way for the rest of the show! The evening was fun and entertaining. Thanks again! Thank You! It was Magical. :-) Keeping 11 kids occupied for 1/2 hour plus was great! 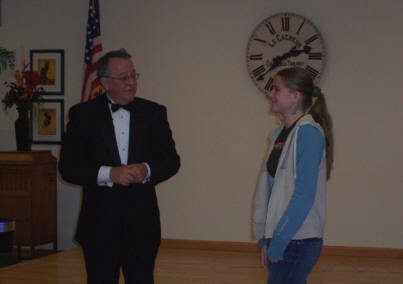 Mr. Magic - Very friendly with great audience interaction skills. Kids and adults enjoyed the show. 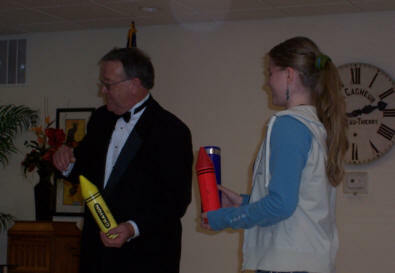 Kids liked the "Magic Wands" for participation and the "Mr. Zippy" take home trick. Tricks were fun and well executed. Mr. Magic is a professional...great outfit and props. We'll use him again! 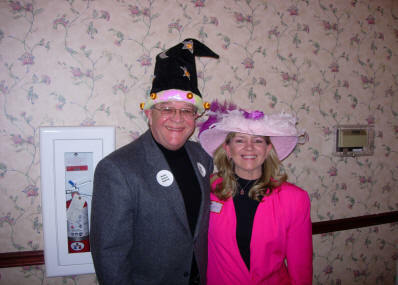 Thank you so much for your support of Wonderland Express, held at the Sunriver Resort! As a result of the tremendous outpouring of volunteer support, such as yours, we were able to create a memorable experience for over 75 families, including almost 200 children. Children who attended walked away with magical memories that will last a lifetime...and parents were able to give their children the gift of quality family time. 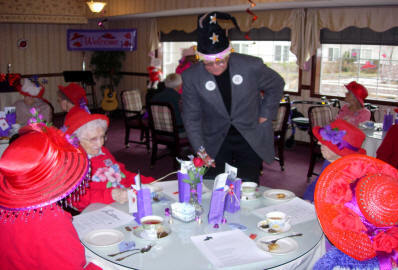 We hope we can count on your support for the 6th Annual Wonderland Express, scheduled for December 16, 2007. Thanks Roger. It's Tuesday and I'm still getting wonderful comments about last Saturdays show. 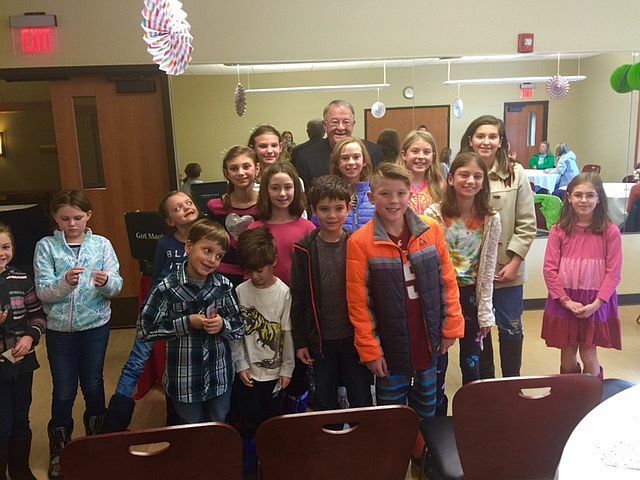 Kids and adults had a wonderful time. I will be calling in next month to book for 2007. To the funniest magician I know! My deepest appreciation for your wonderful and professional act. It was a pleasure to work with you and would so much look forward to the opportunity to work with you again. We can't thank you enough for your part in making the Bend Centennial Review and Retrospective a huge success. We've heard over and over again how much the audiences enjoyed the show especially the local talent we were so lucky to have discovered in Bend. Your magic/comedy act was a highlight of the show. You are an amazing talent and we're lucky you chose to share it to benefit the Bend Centennial. You definitely helped to put the "Magic" in our "Music, Magic, and Moonlight". Thank you so much and I hope to have the opportunity to watch your magic again in the future. Great Show! We are looking forward to having you back for some Dinner Shows. As you know, I had a great time up on stage with you, embellishing your act. As well, you were truly outstanding and I heard nothing but positive comments about your show. Not only was the magic great, but your sense of humor really worked the crowd too. You truly were the "icing on the cake" for our annual conference dinner. Thank you for an enjoyable show to entertain our guests...big and little. All were loving the show, Excellent Job! You dazzled the crowd and left them with the famous expression -- "How did he do that?" 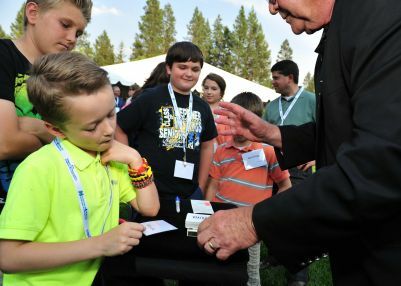 Your magical array of card an rope tricks...along with your mentalism tricks baffled young and old alike. It was a great performance and your stage presence made the entire Annual Company Picnic a big hit. Thank you for an awesome show. You were a hit, everyone thought you were great and the best part was Jack’s grin from ear to ear and laughter when he was assisting you. You made it a great 5th Birthday for him and you kept the rest of us all well entertained. I was very impressed. Attached are some photos of the party. Thanks again. Good show, very light hearted entertainment. Your performance was very impressive among the church group, and we are looking forward to having you back next year. Many thanks to you Roger, for providing such an entertaining magic show for the annual picnic. I know it was a difficult day, family wise, but I really appreciated your nice spirit. A lot of people commented on the show, saying how much they enjoyed it. Evidentially you do have some unique kinds of acts. It was obvious to observe the crowd that they were having a great time. Thanks for being part of our fun. God bless! To view a "Photo Show" of Mr. Magic's Stage Show click the link below. 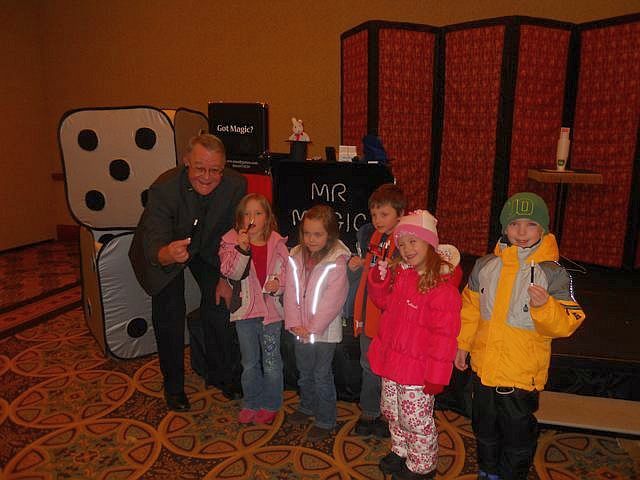 After the show with "new" magicians showing off their Mr. Magic Mini-Wands! 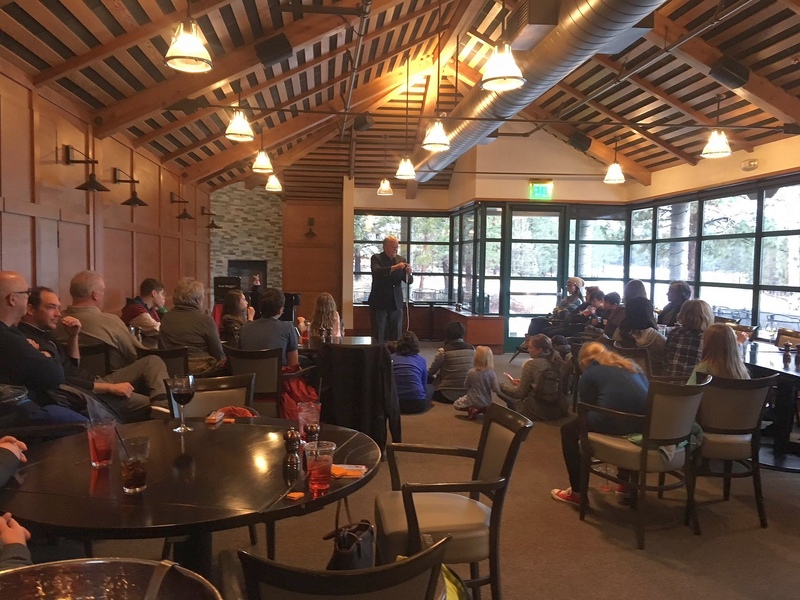 "Besson Commons - Sunriver Resort"